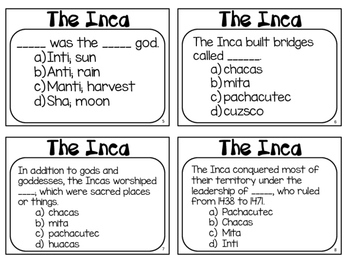 The 32 Inca Task Cards have students identifying important aspects of the Inca culture and answering questions that dig deeper into the life of the Inca and the fall of the Inca Empire. 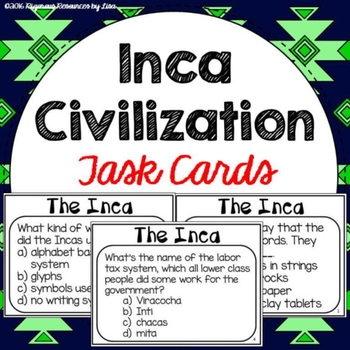 Use the Inca Task Cards as a station, lab, “Scoot” game, partner work, review or in small groups! 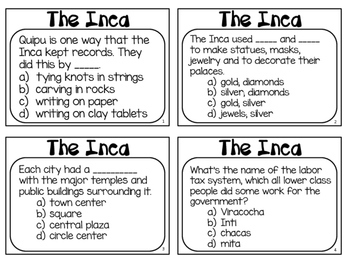 Task cards are an engaging alternative to a worksheet! Please look at the preview to see the resource before purchasing! 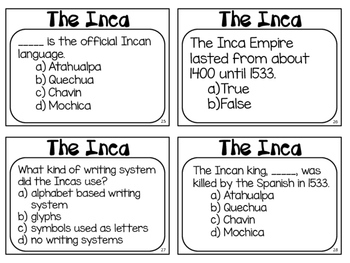 Student recording sheet and answer key are included! Do you want 50% of all my new uploads? Follow me!! All of my resources are 50% off in the first 24 hours of being uploaded. Follow me by clicking the green star under my name to be notified when I upload a new resource.